Yesterday I was looking for a specific photograph about which all I could remember was that it was located someplace you wouldn’t expect. I found it (naturally!) but in the course of the search I also came across this charming image from the Homecoming celebration in 1967. I think they were getting ready to lay a wreath at the statue of WMR and it was raining but not raining hard enough to interfere. I love everyone’s rain gear! You just don’t see those bonnets anymore. 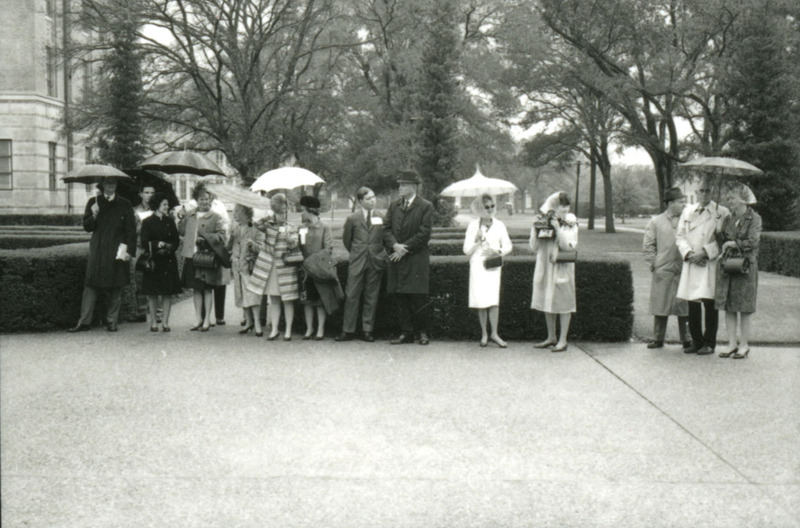 I can identify most of these folks: I don’t know the couple at the far left, but that’s Malcolm Lovett Sr. and possibly his wife Martha, Rice Chancellor Carey Croneis and his wife, President Pitzer and his wife Jean, and at right Miss Sarah Lane and another woman I can’t see. 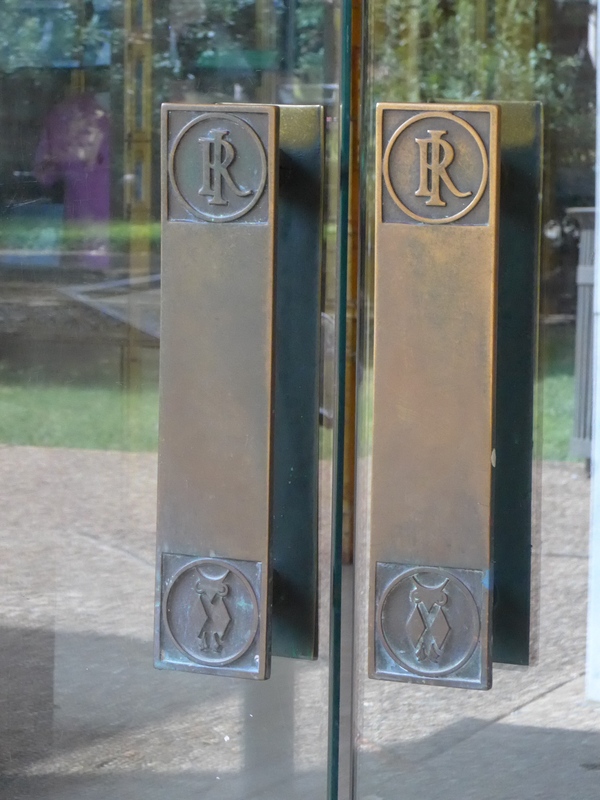 Bonus: The second attempt to install the handle on the RMC door. Close enough. I remember the wind whistling between those RMC doors when the AC was working hard. Do they still do that? I love looking at the old aerial photos you publish. 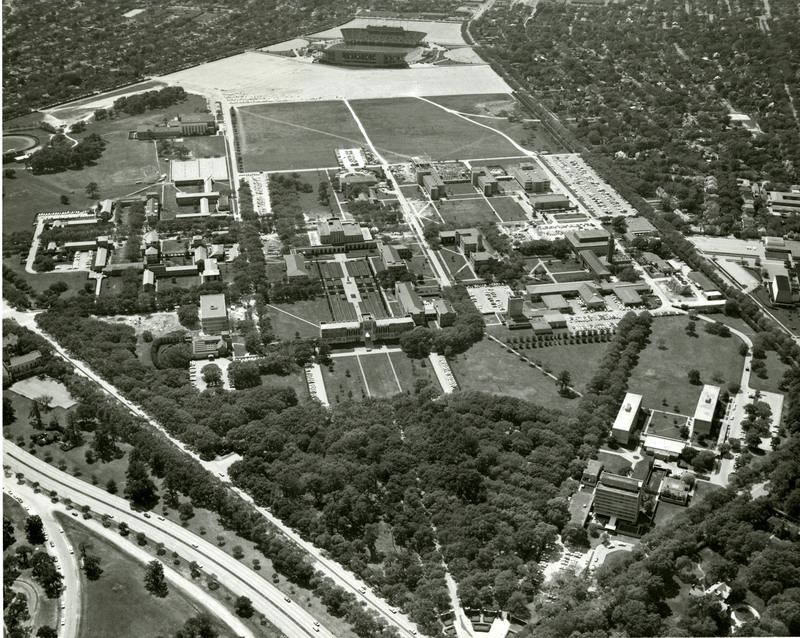 Has anyone ever built a time-lapse animation showing the evolution of the campus? Funny you should mention that. I’m working on a something similar with a group of Rice folks who are far more sophisticated than I am with technology. Stay tuned. More aerials tomorrow too, including a really interesting one from 1919. My immediate reaction was, “wow, another configuration for the hedges!” I wonder, though, if this photo shows an intermediate state during the transition to the 1970’s configuration. Do we know when the replantings occurred? No. But I bet we can figure it out. 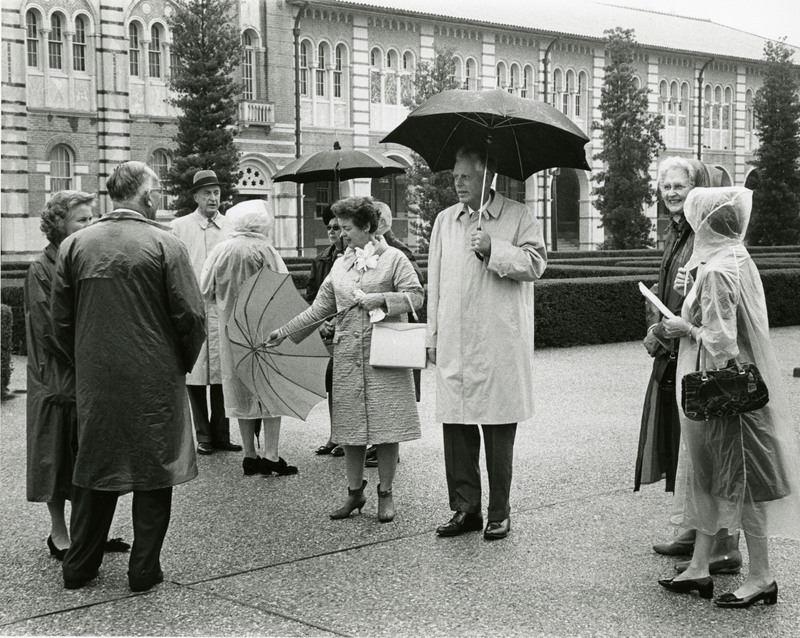 The maze-style plantings near the cross-quad walkways were the dominant form by fall 1969. By spring 1971 there were blackberry vines running through the hedges toward the Physics Building. Did you notice your line of Crape Myrtles near the women’s colleges appears in this aerial? One oddity in the 1967 photo is the condition of the old baseball field behind Hanszen and Weiss Colleges. Several haphazard trucks appear where the stands should be. The infield is not defined. It looks like they are either constructing the field or totally reconfiguring the field. Does anyone know the answer? Rick, you are probably right about that area being the baseball field. How primitive! But that was the field where I had such fond memories in the early 70s of harassing the UT baseball team by catapulting water balloons atop the 5th floor Hanszen sky deck, blinding the UT pitchers with large mirrors, and streaking with the basketball team and Wiess College, backwards along the bases, many of us painted burnt orange head to toe and inbetween. I hope the statue of limitations has passed for all those infractions. Otherwise, Dr. Stephen Baker, the Hanszen Master at the time, will be interrupting my afternoon nap again with another long litany of violations which my cohorts and myself have committed. We might be placed on triple secret probation by Dr. Sam Carrington. Again. If so you would probably have to wait in line for my roommate for his water balloon attacks on Wiess. (I remember one day when Dr. Baker was telling the college to try reduce the amount of physical damage and he walked in proclaiming he had just broken 10 to 20 windows). I don’t remember specifics about the hedges, but I do remember one heck of a lot of construction mess during construction of the final building on the quad in 1970-1971. There’s a photo of the members of Student Senate in (probably) the 1971 yearbook — we posed in/among the construction mess. That would have been Sewall Hall, which thanks to its charge to mirror the Physics building had two floors of occupied basement and a lower-level giant courtyard and workshop area. Probably the largest excavation on campus up to that time.